Panel Form - Walls and slab being prepared for concrete. 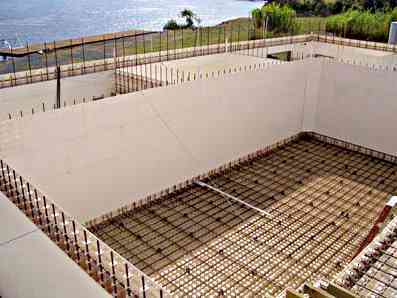 PanelFormTM Building System consists of panels that interlock to create permanent formwork. Each panel is 600 x 1200 mm, weighs 4.5kg has two faces: a smooth face, which forms the outer surface of the wall and structure, and a ribbed face with prongs. When creating a wall, panels are positioned with their prongs overlapping, and metal rods are run through the prongs to hold the panels in place. In addition to this, the panel's periphery is designed with an interlocking male/female button system which is used to snap panels together to form a continuous surface. 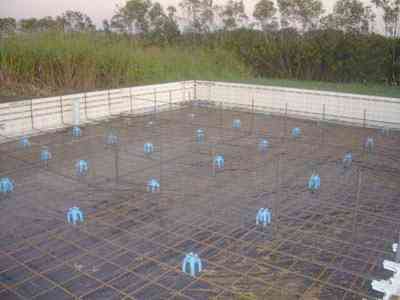 Panel Form - A ground level slab ready to pour concrete. The setup is similar to concrete masonry construction using "E-Blocks"
After the panels are interlocked and secured with reinforcing steel rods (per engineer's detail) concrete can be poured into the cavity. Recommended pouring height is 2.4 meters. It is not necessary to render or paint the outer surface after the concrete has been poured. 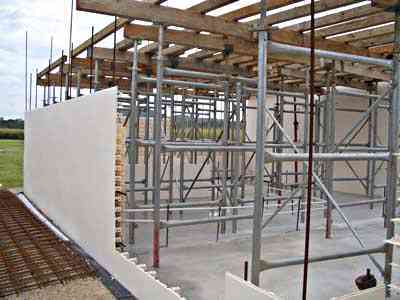 Panel Form - Walls be prepared and the conventional supports in place for a suspended slab. PanelFormTM building system is extremely adaptable. The structures do not need to be filled with concrete. Structural walls can be achieved with a combination of concrete columns and any of these alternative materials. Panels that have been filled with clay or mud are reusable. Most importantly, PanelForm ; installation does not require skilled labour. This makes it an ideal building system for developing nations. On first glance at the photos I just couldn't see how those walls were held together considering the hydrostatic pressures involved. The solution to this, of simply slipping a length of rebar through each set of prongs is absolutely brilliant. No through bolts, no she bolts, no snap ties, no keys and wedges. The remote area, third world aspect of this system is also compelling. Leave this panel form page and back to home.